Dia das bruxas in Equestria. . HD Wallpaper and background images in the my little pony - a amizade é mágica club tagged: my little pony friendship is magic. I officially want a Gummy suit now. And what the heck, a Pinkie suit for my cat. This makes me feel sooooo happy...some of my favorite characters celebrating one of my favorite holidays. :3 Pinkie's costume is genius. It's too funny, and so her. 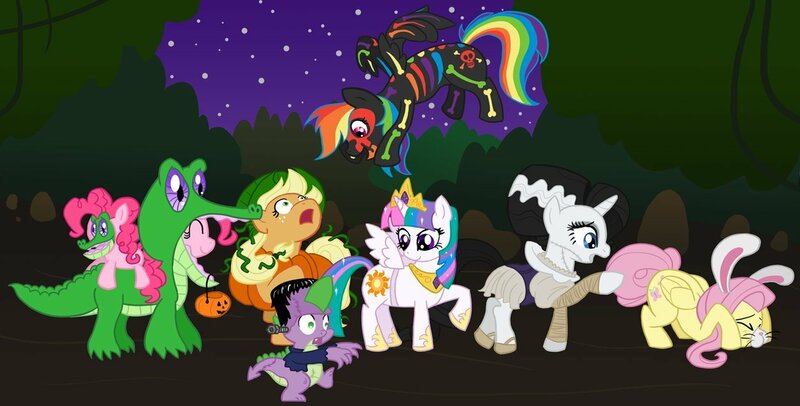 My favorites are Rainbow Dash's skeleton suit (she's like a Thestral! ), which reminds me of the skeleton costume that the Lisa Frank dog Casey wears...and Applejack's pumpkin. ^o^ Twilight's and Rarity's are perfect for them, and they look awesome. Especially Rare. Spike and Fluttershy's are adooooorable. HA--Rarity is the Bride of Frankenstein. I wonder whether they planned that, or if not, which one chose their costume first. Maybe it was just a coincidence, but methinketh not...! pinkie and gummy are so funny!